A while back, Spud asked me to make Pikachu Pancakes. But then he got the Pokémon Cookbook and wanted to make even more Pokémon themed foods! Before we get to the food, let’s talk book review. My son loves Pokemon, so he picked this cookbook up at the book fair. The foods are very cute, however for a book that says "The ingredients and recipes in this cookbook have been adjusted so that even children who have never cooked before can try these out" (p. 2), there are an awful lot of ingredients I have never heard of! Presumably, one would need access to Japanese convenience foods to make several of these recipes. Bottom line: fun to look at, not so great to cook from. 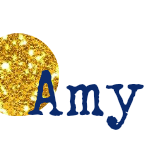 So, we ended up making a lot of changes to the recipes because they sounded super unappealing to out American palates or contained ingredients that would be difficult to come by in a landlocked state. Spud was actually overjoyed when he saw Piplup featured in his book. He knows I love penguins and since Piplup is a penguin sort of thing, he decreed that Piplup was officially my favorite Pokemon. No, he didn’t ask my opinion. And no, I didn’t really care. But he is so excited and passionate about his Poke-menu, that I was excited too. In the book, Piplup is make of some horror called “milk gelatin”. I have a feeling it would be one of those things that got looked at but not eaten in my house. However, since Spud is a beginning reader, he was relying on me to read him the ingredient lists for these recipes. I told him it was yogurt, and we went to the kitchen! This is a spin on my favorite parfait (without the granola) and Spud was super jazzed about the addition of jam! Since we had the fruit out, we also decided to tackle Combee, which was super easy since he’s just 3 bananas slices sitting next to each other! Place the apple bits in an even layer in a shallow bowl. Top with the yogurt. 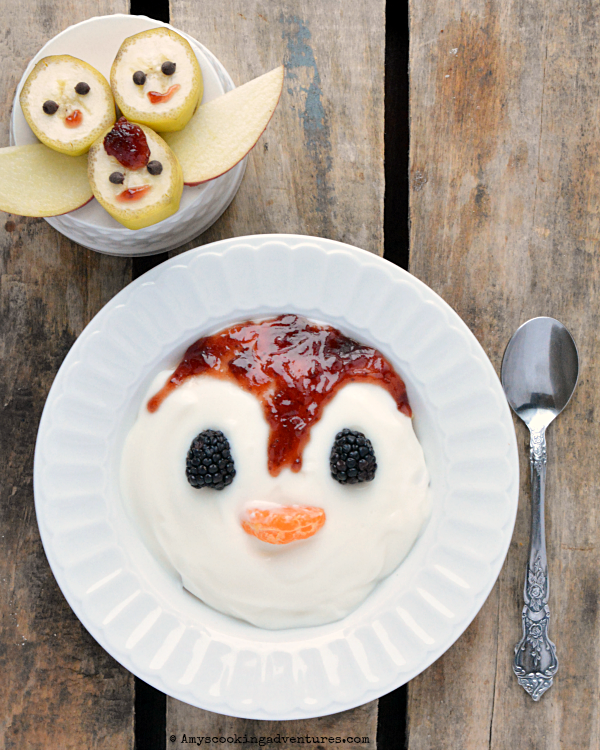 Carefully add the jam in the shape of Piplup’s forehead. Add blackberries as eyes and orange wedge as the beak. Place the bananas in a triangle shape. Add mini chocolate ships for the eye and jam for the mouths and forehead of one combee. Place apple slices on the sides for wings. Calling all Pokemon fans! You don't want to miss this Piplup Parfait and Combee! Way to encourage your little guys love of reading with love of food and spending time in the kitchen.